The Redemptorists » The Perpetual Help Center is moving! 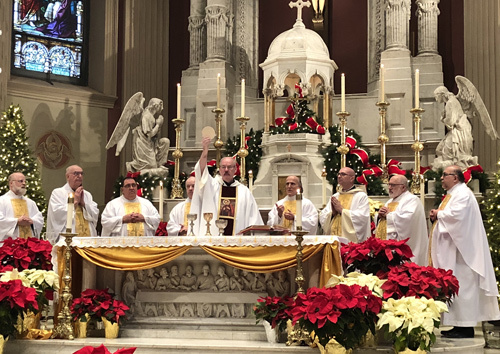 Father Paul Borowski, C.Ss.R., Provincial Superior (center), celebrates Mass on Epiphany 2018 at St. Peter the Apostle Church in Philadelphia. The Perpetual Help Center–the office that provides communications, promotes devotion to Our Mother of Perpetual Help, and raises funds for the Province–is moving! As of Friday, February 16, we’re relocating from Charles Carroll House in Annapolis, Maryland, to the Shrine of St. John Neumann/St. Peter the Apostle Church in Philadelphia, a beautiful and historic building dedicated in 1847. Our phone numbers will remain the same (toll-free: 877-876-7662) and all mail sent to our address in Annapolis will be forwarded to Philadelphia. Our new address will be 1019 N. 5th St., Philadelphia, PA 19123. We hope you’ll visit us at the Shrine of St. John Neumann, and we ask your patience as we make this transition to our new home. St. John Neumann, pray for us!